In the last few years, the open-source desktop planetarium program Stellarium has become ever more popular for research and dissemination of results in Cultural Astronomy. In this time we (LBI ArchPro and TU Wien) have added significant capabilities for applications in Cultural Astronomy to the program, in particular a way to allow virtual 3D exploration of architecture from any period. The major part of this chapter describes our recent accomplishments for allowing its use in a multi-screen installation running both completely automated and manually controlled setups in an exhibition about Stonehenge. During the development time, also the accuracy of astronomical simulation has been greatly improved. 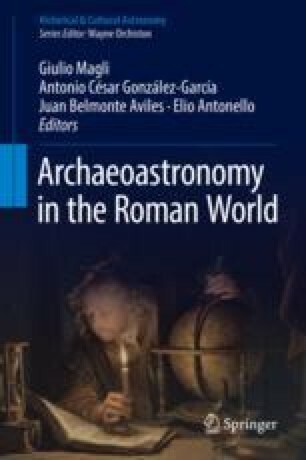 The final part of this chapter (authored by B. Frischer) presents the latest application examples, in particular of these 3D capabilities, for Cultural Astronomy research in the Roman world. The Skyscape Planetarium was developed as part of the exhibition project ‘STONEHENGE. A Hidden Landscape’ at the MAMUZ Museum Mistelbach in Austria, which provided considerable developing time for the new and improved features presented here that were published in Stellarium version 0.15.0 (released 31 July 2016). The 3D models and renderings of the Stonehenge landscape were created by LBI ArchPro’s partner 7reasons. In the weeks before the opening, we were supported also by Stellarium maintainer Alexander Wolf (Barnaul, Russia) who even created a new customized installer package with some critical corrections built overnight just in time to set up at the Museum 2 days before the opening. Florian’s work on the RemoteControl plugin was supported by the ESA Summer of Code in Space programme 2015. The Ludwig Boltzmann Institute for Archaeological Prospection and Virtual Archaeology (http://archpro.lbg.ac.at) is based on an international cooperation of the Ludwig Boltzmann Gesellschaft (Austria), the University of Vienna (Austria), the Vienna University of Technology (Austria), ZAMG-the Austrian Central Institute for Meteorology and Geodynamics (Austria), the Province of Lower Austria (Austria), Airborne Technologies (Austria), 7reasons (Austria), the Austrian Academy of Sciences (Austria), the Austrian Archaeological Institute (Austria), RGZM-the Roman-Germanic Central Museum Mainz (Germany), the National Historical Museums—Contract Archaeology Service (Sweden), the University of Birmingham (England), the Vestfold County Council (Norway) and NIKU-the Norwegian Institute for Cultural Heritage Research (Norway). MAMUZ Exhibition website: http://www.mamuz.at/en/the-museum/museum-mistelbach/ausstellungen-museum-mistelbach/4-stonehenge-a-hidden-landscape?set_language=en (seen on 27 June 2017). Stellarium website: http://stellarium.org (seen on 21 June 2017).